The Bank of Canada latest reports confirm a sluggish economy – economic growth of only 1.2% annualized for the first half of 2014. This disappointing economic performance will most likely compel the Bank of Canada to keep its present benchmark interest rate at 1% (at least for the second half of 2014). In such uneasy circumstances the Gardner Business Media Report: “2014 World Machine Tool Output and Consumption Survey” has forecasted that the overall worldwide machine tool consumption will grow 6.2% in 2014 (over 2013) – to a total value of US$58,3B. Consumption (C) of machine tools of a certain country (or world area) is calculated by adding imports (I) to production (P) and subtracting exports (E): C=I+P-E.
USA: growth of 15% to $9.3B. Germany: growth of 12% to $7.9B. South Korea: growth of 13% to $5.1B. Japan: growth of 6% to $4.5B. 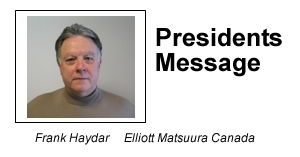 The 2014 Gardner forecast was created using the three most important leading indicators of machine tools consumption: money supply, capacity utilization and manufacturing production. Interesting to note that PRODUCTION of machine tools is always higher than CONSUMPTION – the difference is the amount of INVENTORY held by machine tool builders and their distributors. And how did Canada perform at the half year mark of 2014, compared with same period of 2013? - CNC Metal Cutting Machines: up 5% for units, up 14% for value. - Non CNC Metal Cutting Machines: down 6% for units, up 13% for value. - CNC Metal Forming Machines: up 3% for units, up 4% for value. - Non CNC Metal Forming Machines: down 3% for units, same value. - Stamping and Forming Presses: down 3% for units, up 3% for value. As historically the second half of the year is always stronger than the first half, the projected forecast for the complete year of 2014 looks good for our industry. In addition, the largest North American machine tool show, (IMTS), usually a harbinger of increased sales activity, is just around the corner: September 8 to 13, incl. (McCormick Place, Chicago, IL.). Forming machinery orders have recovered somewhat and CNC machines showed a slight increase in units and values. Shears and press brakes had significant increases in units and values while laser cutting machines had increased value with a decrease in units. 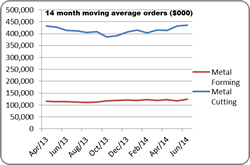 Manual machine orders and units remain largely unchanged. Average order size for CNC metal cutting machinery YTD were as follows: horizontal lathes, $196,800, vertical spindle lathes, $225,000, multitasking lathes, $387,000 VMC up to 40” travel, $121,000, VMC above 40” travel, $220,000, VMC five or more axis, $593,000, horizontal machining centers, $416,000, horizontal machining centers 5axis, $1,590,000, milling machines , $43,000, horizontal and vertical boring machines, $748,000, wire EDM, $169,000, sinker EDM, $235,000, grinders, $268,000, CMM, $138,000, saws, $75,000, others, $244,000. Average order size for manual metal cutting machines was $17,500. Average order size for CNC fabricating machinery were: press brakes, $136,000, shears, $47,000, turret punches, $475.000, profile cutting laser, $774,000, profile cutting plasma, $286,000, profile cutting water jet, $242,000, tube benders, $37,000, others, $182,000. Born in Agincourt Ontario in 1935 Jim worked as an apprentice tool and die maker at Emmonds Tool and Die in Scarborough, Ontario. From there he went to Williams and Wilson where he rose through the ranks to become Sales Manager. When Williams and Wilson closed it’s operations in Ontario, Jim went to work for SMS Machine Tools as Marketing Manager until his retirement in 1995. With machine tools in his blood Jim then took on the role of Executive Director of CMTDA , a position he held until he finally retired for good in 2008. Jim and his wife of 57 years lived in Minden Ontario He was an avid golfer and curler and was active in the Masons. The spring meeting which took place again at the Sightlines restaurant in the Rogers Centre in June was a great success with 115 CMTDA members, spouses, friends and family in attendance. The buffet dinner was excellent and that along with an open bar made for a memorable evening. The 2015 edition of the CMTDA directory will be published in the Spring of 2015 and we would urge every member to review their listing in the 2014 edition and be prepared to make any changes when Canadian Metalworking approaches you in the fall for any updates. >The Canadian Machine Tool Distributors Association was founded in 1942 as a trade association dedicated to the marketing of machine tools and services in Canada through distributorship companies.